. : Lunar Palace v.5 - Japanese: Tuxedo Kamen :. Mamoru is Usagi's love for all eternity. Mamoru lives alone in an apartment in Juubangai. His parents died in a car accident when he was little. 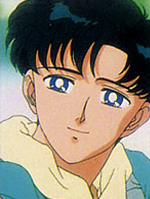 Mamoru is also known as King Endymion, Prince Endymion, Prince of the Earth, and Tuxedo Kamen. In Sailor Moon R, he appeared as Tsukikage no Knight. Mamoru went to study overseas in America. On his way there Galaxia attacked the planet was on. She found out that Mamoru had the true star seed of the Earth. She Killed him by taking his star seed. That's Mamoru never reached America, and Usagi never received a letter from him.